abeMeda is able to generate an industrial strength MD5 checksum for every single file in a catalog. We call that feature FileCheck and it is integrated nicely in abeMeda. The FileCheck value is very useful for photographers who wish to ensure that all their precious photo files on any backup and archive disk are still fully readable and unchanged, and of course for anyone who wants to check for modifications of files on any disk. 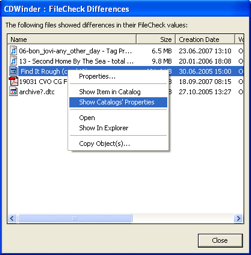 If you enable FileCheck in the cataloging preferences in abeMeda, every new catalog you create or update will contain this FileCheck value for every single file. As this operation of course takes quite some time, since every file must be read and computed completely, this is by default turned off. You can then check either a single file or even an entire catalog by using the context menu. If you verify the FileCheck values for an entire catalog, abeMeda will even show you a nice window containing all files that did NOT pass the check, so you know exactly which files are damaged and need to be replaced.